In February, Mr Oli took charge as Nepal's prime minister for the second time. The Nepal prime minister was received at the airport by Home Minister Rajnath Singh. 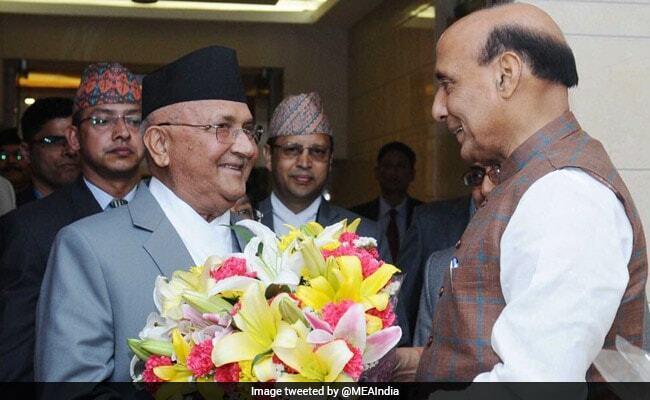 New Delhi: Nepal's Prime Minister K P Sharma Oli arrived on a three-day visit to India, his first foreign destination since he took office in February. He will meet Prime Minister Narendra Modi in the evening and will hold delegation-level talks tomorrow. The visiting leader will be accorded a ceremonial reception at the Rashtrapati Bhavan tomorrow. During his visit, Mr Oli will meet Prime Minister Narendra Modi, and possible deals on the use of Indian waterways by Nepal as well as an expansion of an India-backed railway to Kathmandu have been mooted. Nepal's prime minister is also expected to push for India to complete previously promised infrastructure projects, many of which have limped along for decades and are key to Mr Oli's ambitious plans to kickstart moribund growth at home. New Delhi's relation with Kathmandu soured during Oli's last term in office in 2015 after deadly protests in southern Nepal over a controversial new constitution that led to a blockade of the border with India. While congratulating Mr Oli over phone on his appointment to the top executive post in February, Prime Minister Modi had extended an invitation to him for a visit to India.